Investors who have made a mint from Fundsmith Equity (B41YBW7) are now deciding whether to back a new fund from the same asset manager, to be called Smithson Investment Trust. The prospectus has shed some more light on the strategy and potential investments, meaning we now have a much better idea of the possible shape of the trust’s portfolio. Our conclusion from these bits of information and analysis of asset manager Fundsmith’s longer term track record lead us to believe this could be another winner. We suggest you take part in the fund’s IPO (initial public offering) offer which is available via most of the major stockbrokers and investment platforms until 12 October – or wait until the shares start trading on the open market from 19 October. To explain why we have come to this conclusion, and to help you better understand the proposition, we now look at the pros and cons of investing in Smithson. We also discuss some of the potential investments. It is rare to see an investment trust give so much information and in a very clear manner ahead of joining the stock market. Fundsmith is unique as an asset manager in publishing an ‘owner’s manual’ for its funds. These are written in an easy-to-understand fashion. The accompanying prospectus for Smithson is also fairly easy to comprehend. Fundsmith Equity fund has delivered 309% total return since it launched in November 2010, adding up to to a 19.7% annualised return. Fundsmith chief executive Terry Smith has created a very clear investment process which is to buy high quality companies that aren’t trading on excessive valuations and to hold them for a long time. And this approach clearly works given the past performance. The strategy avoids companies which rely on debt to achieve an acceptable return and instead focuses on businesses with clear growth prospects and whose assets are intangible and difficult to replicate. The same approach applies to Smithson; the main difference is the size of company being sought. Fundsmith Equity invests in large cap stocks whereas the new investment trust is targeting mid and small caps. 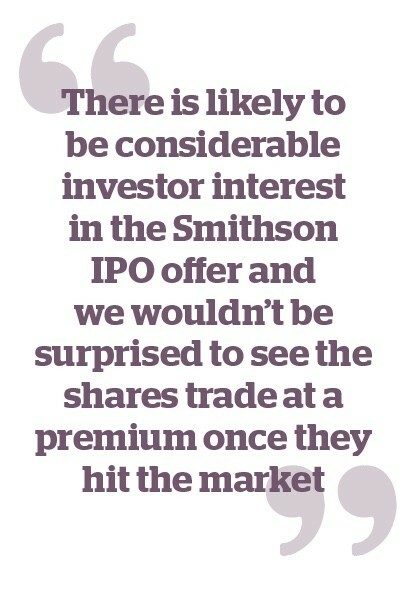 There is likely to be considerable investor interest in the Smithson IPO offer and we wouldn’t be surprised to see the shares trade at a premium to net asset value once they hit the market. Essentially that would mean anyone taking part in the IPO offer could see an immediate gain on paper, although this is not guaranteed. For example, Neil Woodford was once of the most popular fund managers in the UK when he launched Woodford Patient Capital Trust (WPCT) in 2015. Such was the demand for its shares that the investment trust traded 6% above its IPO price within the first week of trading, and a 10% premium in a little over a month. Fundsmith’s second fund, Fundsmith Emerging Equities Trust (FEET), saw its share price rise by 8% in its first week of trading in 2014. In both situations, investors bid up the shares either because they didn’t get their desired allocation in the IPO offer and wanted more, or they ignored the offer and waited to buy on the open market. We think it is slightly misleading that Smithson is being marketed as a small and mid-cap fund. It is targeting companies that are worth between £500m and £15bn, with the expected average to be £7bn. We would reclassify this as a pure mid cap fund. We classify small cap as being below £500m, although acknowledging our definition doesn’t always match that of the institutional investment community. To put this in some context, chemicals group Johnson Matthey (JMAT) and retailer Next (NXT) are both worth in the region of £7bn, and most people consider these to be large cap stocks. You aren’t going to make much money from dividends with Smithson as the prospectus implies the fund isn’t expecting significant income from the shares in which it will invest. Terry Smith isn’t going to be the manager of the fund, which may act as a deterrent for some investors. Instead, two former employees of investment bank Goldman Sachs will manage the portfolio, albeit following the defined Fundsmith investment process and consulting Smith on every portfolio decision. The fee structure is slightly different to the norm as it will be linked to the share price, not net asset value. So Fundsmith will collect more money if the shares are trading at a premium to net asset value, something which isn’t out of the question. That does align the interests of the firm with shareholders though, as Fundsmith would collect less than it could have done under the normal industry model if the shares trade below NAV. The other issue to consider is whether the high profile launch of this investment trust feels like top of the market behaviour. We’re long overdue a correction in the market and Smithson’s timing looks quite risky. Should the market fall, Terry Smith would probably argue his firm’s new fund is getting an opportunity to pick up good companies at even cheaper prices. Investors should expect to see a concentrated portfolio potentially with a bias towards tech, industrial and healthcare stocks. It is targeting companies which have an established track record of success, ‘such as having already established a dominant market share in their niche product or service, or having brands or patents which others would find difficult, if not impossible to replicate,’ says the Smithson prospectus. Research to date by the trust’s fund managers has found 83 companies which meet its required criteria. Half are listed on a stock exchange in the US, 14% in the UK and the rest in places ranging from Japan and France to Italy and New Zealand. UK-quoted names which have been highlighted by Smith in media calls as looking suitable include drinks group Fevertree Drinks (FEVR:AIM) and engineer Spirax Sarco (SPX). US-listed fried chicken chain Wingstop has also been touted, so too US airline ticket booking system provider Sabre. 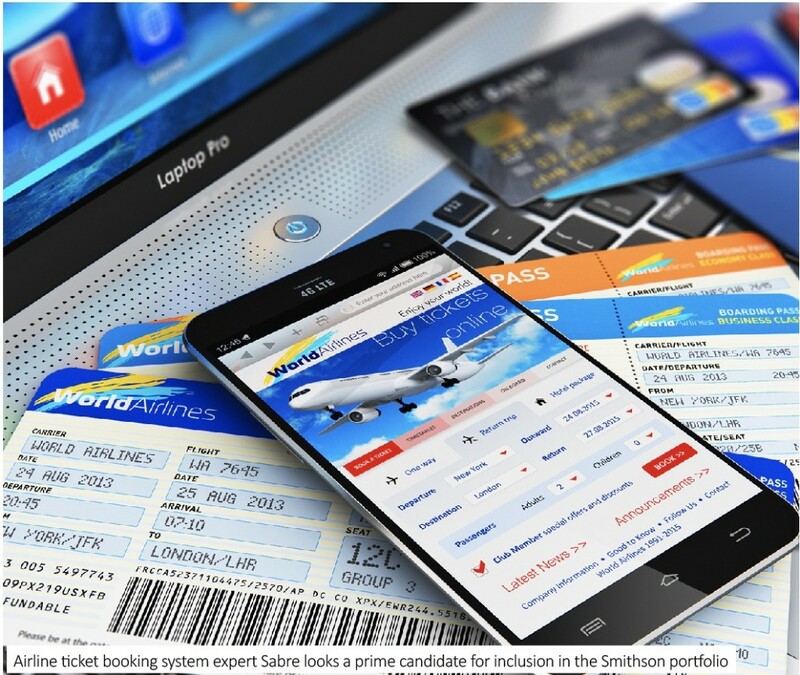 Further hints can be found in Smithson’s owner’s manual which features a range of corporate logos relating to firms in which the fund could theoretically make an investment, says a spokesperson for Fundsmith. These include sinks-to-toilet flushing systems maker Geberit, patient monitoring technology group Masimo and medical devices specialist Fisher & Paykel Healthcare. And a corporate presentation includes even more potential names such as safety expert Halma (HLMA), distribution business Diploma (DPLM) and property portal Rightmove (RMV). 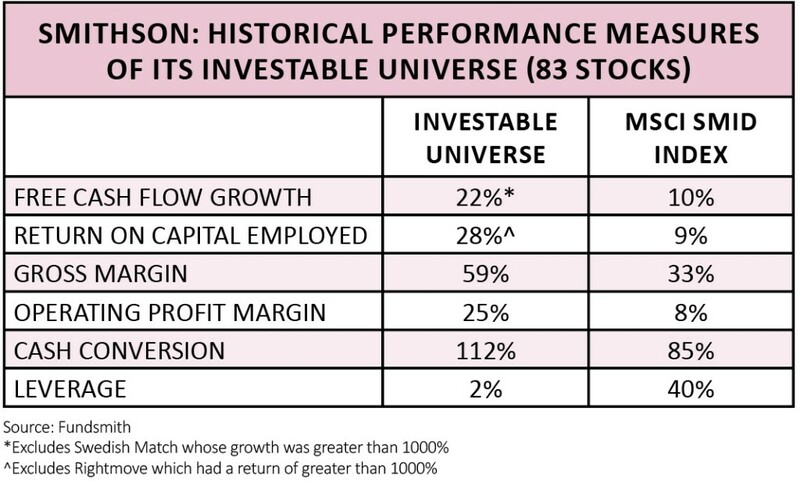 The Smithson team have run a backtest on the 83 companies in its investable universe, to see how the group would have performed if they were the actual portfolio. The results are very good, as you can see from the accompanying table. The annualised return would have been 28.6% over five years with this hypothetical portfolio versus 7.2% from the FTSE 100. 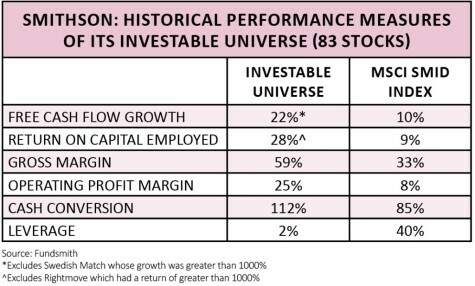 While these figures are useful, investors should appreciate that no-one knows what the future performance will be, and the backtest featured 83 companies – the real portfolio will only have 25 to 40 investments. The answer is a resounding ‘yes’. We expect the fund managers to take the long term view about what the business could be worth rather than look at near-term metrics, which may highlight rich valuations for some of the implied holdings. The new fund managers may be unfamiliar names to most investors but they will be following a clear and proven investment process, essentially a template that has worked well in the past. ‘We will only invest in the equity of companies which we believe can compound in value over many years, if not decades, where we can remain a happy owner, safe in the knowledge that in five to 10 years’ time our investment is likely to be worth significantly more than what we paid for it,’ says the Smithson owner’s manual. ‘We work on the principle that in order to maximise long term profits, you should choose investments with the highest probability of an acceptable profit, rather than those with a small probability of a very high profit (and therefore a much larger probability of a loss).